✔ Lively comment and analysis of the issues facing today’s Church, plus weekly features, books, arts and cartoons! 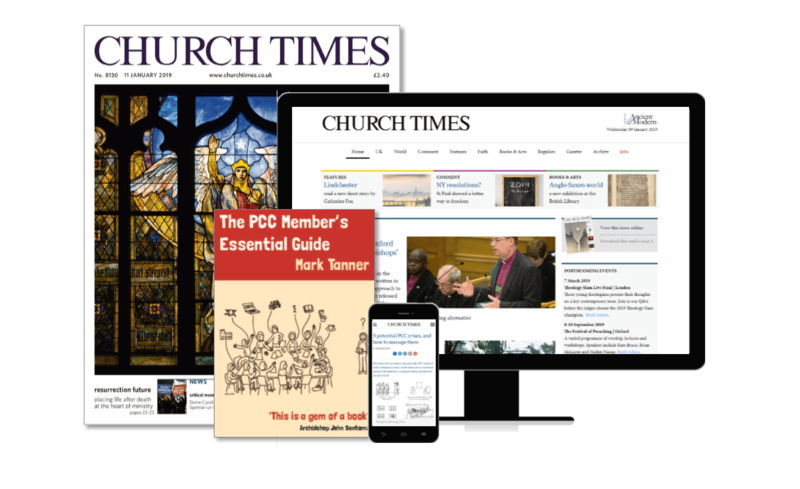 You'll get: the Church Times delivered every week, full use of the website and iPhone/iPad app, and digital access to every copy since 1863. Plus: we'll send you a free copy of The PCC Member's Essential Guide (worth £6.99) when you subscribe. This offer is open to new UK subscribers only. You must be a member of a PCC. After six months your subscription will renew at our standard direct debit rate of £85 a year. You can cancel at any time. Offer ends 30 June 2019. Find practical advice on fundraising, building projects, community events, a parish interregnum, appointing a new vicar and more on our PCC resources hub.